SINGAPORE, 5th October, 2017 – EDMI Limited, a leading smart metering solutions provider, has been recognized with the 2017 Asia Pacific AMI Solutions Company of the year by Frost & Sullivan. 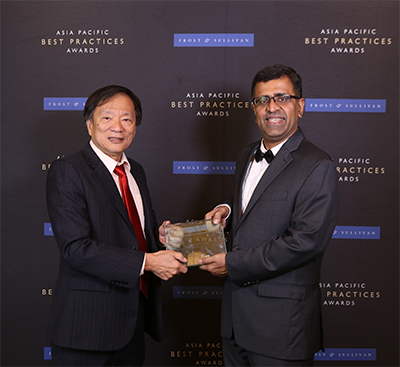 The award was presented to EDMI at the 2017 Frost & Sullivan Asia Pacific Best Practices Awards banquet held at Shangri-La Hotel Singapore on 4th October. “EDMI is one of the leading companies offering AMI solutions in the APAC region,” said Avanthika Satheesh, Industry Analyst for Energy & Environment at Frost & Sullivan. “In 2016, the company was the market leader in ANZ, and has won a significant number of projects in APAC region,” she said. Frost & Sullivan recognized that EDMI has structured its solutions to meet the needs of wide range of energy industry participants – across retail, distribution, generation and other utility services. “EDMI’s customer centric approach ensures the clients receive the best value for their investments in AMI solutions. This has helped them win customer trust and repeated orders, which was key to the company’s success in the region in 2016,” she said. “EDMI is proud to be recognized as Asia Pacific AMI Solutions Company of the year,” said Lee Kwang Mong, Chairman of EDMI Limited. “With our almost 40 years of experience in smart metering, EDMI continues providing high quality and reliable products to our customers worldwide. This award recognition gives them more trust and confidence in selecting EDMI for their smarter energy management,” he said.